Since our return from the walk we have spent time recovering and also went to Africa for a month, visiting Zimbabwe and Malawi (sorry there was no end-of-walk blog, I think we were both just too mentally tired by that stage!). The following blog is our reflections on orphanages we visited whilst in Africa. During our recent trip to Africa we visited three separate orphanages. 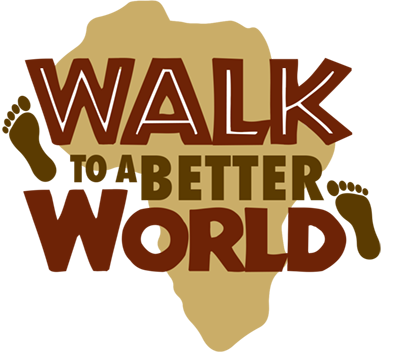 All of them are providing much needed care for orphans and abandoned or abused children in countries where poverty, maternal deaths during childbirth and deaths from HIV/Aids are significant issues. However the way they structure their service and the level of individual care provided in each orphanage was distinctly different. 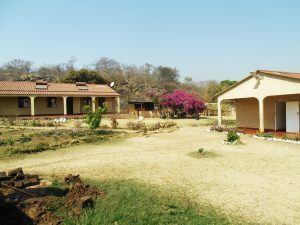 The first orphanage, Ivordale Childrens Home, is located on a farm about 40 minutes drive from Harare, the capital of Zimbabwe. They house 17 children from 4 year old twins to Year 8 students who are 12-13 years old. There are also a handful of older students who are at a local boarding school and return to the home during holidays. The home is set up as two houses with a kitchen, bathroom, lounge room and 3-6 bedrooms with bunk beds in each house and then another separate building (the old dining hall) which has a large room with chairs and tables, a couple of couches, TV and another larger kitchen. This building is used for morning and afternoon prayers, homework sessions, watching movies on weekends and other group activities. The home used to be structured as dormitory style in the two houses with just bedrooms and then everyone came together in the large kitchen/dining hall for meals but the Government has recently changed the rules governing orphanages requiring a more family-like setup so bedrooms had to be converted into kitchens and lounge rooms in each of the houses and the main kitchen in the dining hall is now no longer used. Each house is overseen by a house Mother who also has a bedroom in the house, so the children get more personalised attention. The children attend the local school with children from the surrounding farms, they have chores to do each day including sweeping the floors, washing their own clothes, doing the dishes and cleaning up around the grounds. They also have times in the afternoon to do homework and they attend devotions (prayers) twice a day. The aim is to prepare them for being placed with families where they will be expected to be able to care for themselves. Living in a rural environment means that they have plenty of room to run around and spend a lot of time outside. They regularly climb all over the couple of mulberry trees gathering fruit into old plastic drink bottles which they carry around with them for the rest of the day. The house-parents have started a vegetable garden which provides all their vegetable needs and gives the children the opportunity to learn about cultivating land and growing from seed. Water is a bit of an issue but given they have access to bore water from the pump at the main farm which is pumped direct to their site they are probably in a better situation than most of the families in the area. They have electricity although it regularly goes off for a few hours or sometimes even a full day which means they have to be flexible and switch to cooking on the fireplace and using solar lanterns for light on a regular basis. The second orphanage we visited isn’t actually an orphanage as such but is an orphan care program where children are fostered within the local village by other poor families. 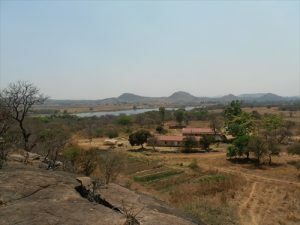 It is located on the outskirts of Lilongwe, the capital of Malawi. The church that runs this program also runs a school and a Community Based Organisation so the children are provided with free education and the foster parents are able to attend the community program. We met a couple of the carers during a tour through the village and both were women with children of their own who also took on several orphans. They live in very basic mud brick structures with two bedrooms and a kitchen. They placed a bamboo matt on the ground outside for us to sit on whilst we talked as they do not have lounge rooms or furniture. One lady had recently been widowed and was caring for four orphans and still had two of her own children still at home plus her adult son. She used to grow vegetables for selling on a small plot of land near the village but her husband’s family took control of it after his death last year so she now has no income and is very worried about the future. As a widow she has no rights to her husband’s possessions including the land and buildings that are their home so she is constantly worried that his family will take that as well and leave her and the children with nothing. There are about 185 children cared for under the Orphan Care program and they attend the school along with other children from the village. The school provides an alternative to the local Government school which is small and basic. There are 532 at the school from pre-school through to Year 8. Access to education is a key part of the care program and they are also provided with a basic meal during school to ensure they eat at least one good meal a day. 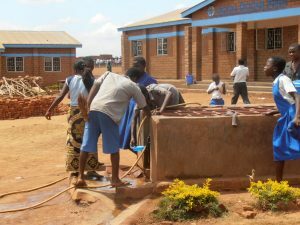 The school itself faces many resource challenges such as having up to 60 students per class and no chairs or tables in the lower grades, only one source of water for the entire school, long drop toilets without a breather (very smelly! 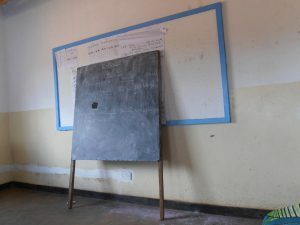 ), small old blackboards often with holes in them (not able to afford whiteboards) and 4-5 students sharing the one text book. 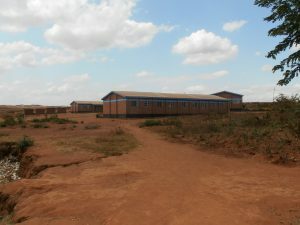 Through the attached Community Organisation they are trying to run projects or small businesses that generate an income for the families that are caring for the orphans and for the school to help cover some of the ongoing running costs and also to fund improvements to the school infrastructure. The third orphanage is also in the outer suburbs of Lilongwe. It is more like a traditional institution based orphanage run by an order of Nuns. The children are grouped by age, 0-1, 1-3 and 3-5. There are dormitory style rooms for each group (one large room with 18 cots lined up for the infants, another with bigger cots for the toddlers etc). There is a large kitchen where all the meals are prepared and a large dining hall where the children are served one group at a time. There is a large covered play area with a concrete floor and another open play area with metal equipment such as slides and swings but again with a concrete floor. The youngest child is only 2 weeks old and several of the infants have ongoing health issues. The facility is run by an order of Nuns and unfortunately English speaking was minimal amoungst the ones there when we visited so our understanding of their setup is limited to what we could observe in the 2 hours we were there. Out of the three different orphanages this one was by far the saddest. The children stay there until they are 5 and then are placed with extended family if there are any (by that time it is hoped that any health problems have been treated and they are able to look after themselves more so they are not a burden). Or they are placed up for adoption (usually with families outside of Africa). We saw toddlers wet themselves with no-one paying attention, infants were fed cheese puffs snacks by the handful (maize flour, vegetable oil, colours and flavours – yuk!) and there wasn’t much evidence of toys or educational stimulation. Although being in this facility is much safer than being left on the streets or abused by families who cannot care for them, it does not seem to provide any individual attention. However, we did meet an 18 year old girl who was helping in the infants room who had grown up in the orphanage and then returned there during school holidays once she went to boarding school. She seemed to be getting on really well so perhaps we are judging the orphanage too harshly. We were inspired by how resourceful and resilient the operators of these orphanages are; doing the best they can with often limited funding and unlimited need. Based on these experiences we have decided to support the first two orphanages by helping them to setup some income generating projects so they are not as reliant on donor funding and they can fund extra resources or maybe even extend their capacity. We think they both have great programs and with a bit of extra help in the form of start up capital will be able to become more self-sufficient and provide positive role modelling for the children. Therefore we have decided to turn our attention to fundraising to set up a project where we can offer interest-free loans to these organisations to help them set up small business ventures where the profits will be used to improve the lives of the children they care for. We are currently working on a micro-finance model and fundraising ideas to form the basis of our support to these programs.